Trophy Brewing is proud to announce our newest collaboration! 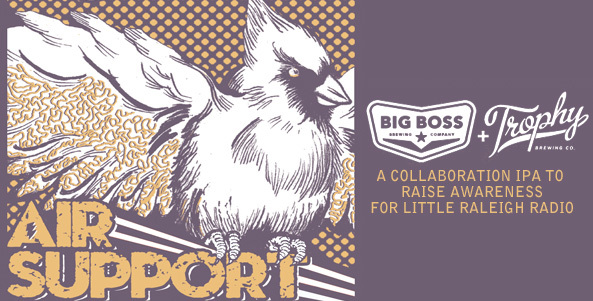 This is a cross-town collaboration with our friends at Big Boss Brewing Company to raise awareness for Little Raleigh Radio! Brewer’s Bobby McInerny (Big Boss Brewery) and Les Stewart (Trophy Brewing) worked together to produce a truly exciting new beer never before brewed by either brewer! We have named the beer “Air Support” to spotlight awareness for Little Raleigh Radio and the programming and content they curate to bring vibrancy to our city. Say it with me “Mosaic, Citra, Amarillo, Mosaic, Citra, Amarillo, repeat” Thats all you will be thinking when you get the first whiff of this golden, 6.5% IPA. Tropical fruit, tangerine, mango and stone fruit. To celebrate the release, Little Raleigh Radio will be programming a day of live broadcasts of some of their favorite shows and featuring some of their favorite bands. The event will take place 11/21 in the Big Boss new taproom from 12-5pm. The crew from Little Raleigh radio will be on hand to share information about what they do and how you can get involved and to collect donations. Previous PostPrevious We found a great parking space for the big game. Next PostNext On the cask engine today is Miss Fitz Belgian pale ale. Australian Ella & Victoria's Secret hops balance rye malts for hoppy spicy finish.